The IHBC is encouraging anyone with an interest in England’s heritage to support the call by Civic Voice (CV) to ‘Tell the All Party Parliamentary Group (APPG) for Civic Societies how conservation cuts are impacting your local area’ by completing their survey. When we work together, we strengthen the civic movement. We can make a difference. We do this by being part of a national civic movement team and talking to civic societies, meeting with them and hearing what is happening up and down across the country. We are build the civic movement from the bottom up to ensure we can make a collective difference. Civic Voice wants to work with civic societies all over England and to support them to come together to focus on the key issues facing conservation areas. 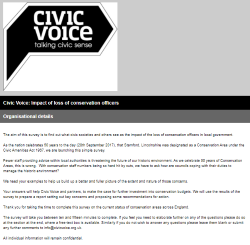 By working with the APPG for Civic Societies (Civic Voice is the secretariat and our members have priority invite to meetings), we can make change happen BUT we need you to tell us how you are being impacted with the cuts to conservation departments. This information will then be directly shared with the APPG for Civic Societies, Ministers and other MPs. Please share this (survey) with your own local contacts. We will be sharing the results of this survey at a future APPG for Civic Societies meeting in Parliament. Ian Harvey, Executive Director of Civic Voice said: ‘We have a choice to make. We either realise that the historic environment and conservation areas add value to the character and identity of the country and resource it accordingly or future generations will ask ‘why did we let this happen’ as we see more examples of our historic environment disappearing in front of us. I have every confidence that the civic movement is ready to hear that call’.